ï»¿ New Guy w/ 70 Challenger - Great/Lucky find!!! New Guy w/ 70 Challenger - Great/Lucky find!!! 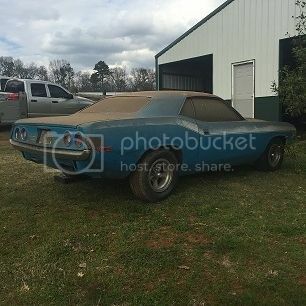 Re: New Guy w/ 70 Challenger - Great/Lucky find!!! 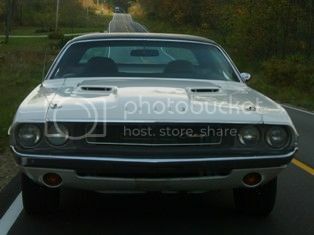 Wow... just realized the tires are BFG "Belted T/A"s. Thats what I ran on my '71 its entire daily driver career! You should look them over carefully before driving much, or enthusiastically; I don't know when BFG stopped making those but they are definitely old, and could be suffering from dry rot or cracks simply from age, despite apparently nice storage conditions. What an awesome find, I'll bet you can't wait to get her going! I appreciate the heads up on the tires. They look GREAT, but I fear you're right, they're probably junk. We'll replace them soooooon. I got to drive her for the first time last night, what a blast. I've got an appointment with a good front end guy, there are some major rattles in the front end. Even the small bumps in the road make plenty of noise. I'll be taking it real easy until that's fixed. Smooth roads only, lower speeds. Thanks for all the good wishes, it just makes this whole deal that much more FUN!!! welcome to this site. Great lookin car. 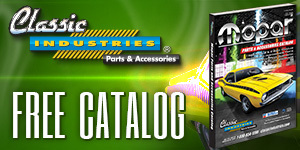 Need someone to drive it for you? I can make the time! This thought may not be politically correct, but is an opinion offered. It may be correct? or it may be wrong? It is not designed to appease those needing shelter from the real world. Cograts on your car. I felt the same way when I got my 71 Cuda. Though I had to wait 4 weeks untill is was delivered via semi from CA to MN. Ya know, I think there is a clinical term for being excited that long. The tires that came off were big time flat spotted, they were date coded 1981!!!!!!!!!!!!!!!!!!!!!!!!! That's probably when the ones still on my car were made... plus they sat out in the Las Vegas sun for 5 years after I had to park the car, before I got it moved here to Ill Annoy. They still hold air but I won't use them for more than rolling it around.